Home / غير مصنف / Yellowstone volcano eruption OVERDUE: What will happen if Yellowstone BLOWS? Three large Yellowstone volcano mega eruptions have previously unleashed apocalyptic devastation. "A super-eruption is the world's biggest bang", says Professor Bill McGuire of the Benfield Greig Hazard Research Centre at the University of London. "It's a volcanic explosion big enough to dwarf all others and with a reach great enough to affect everyone on the planet". A scientific team studying the effects of Yellowstone’s last eruption has suggested the volcano could blow a far faster than previously thought. University of Arizona scientists examined the commonly-held assumption Yellowstone would prepare to blow over several centuries. Fortunately there currently are no indications Yellowstone is preparing to erupt anytime soon. This is despite the pessimistic estimates the supervolcano is thousands of years overdue. When Yellowstone last erupted 630,000 years ago, the super volcano spewed an incredible 240 cubic miles worth of ash and rock. 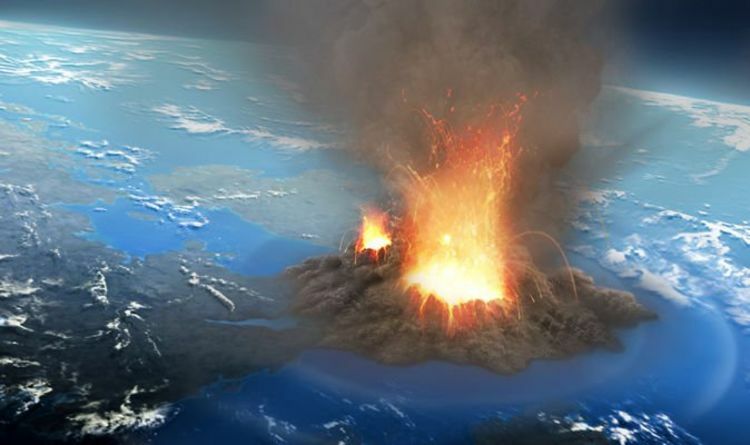 A much smaller eruption, and the last one on record, took place around 70,000 years. And a consensus of scientists believe if Yellowstone were to erupt soon, the eruption would be on a solar scale. Dr Till said: “It would most likely be one of the smaller ones. “If we were looking for warning signs, that's what would we be looking for."